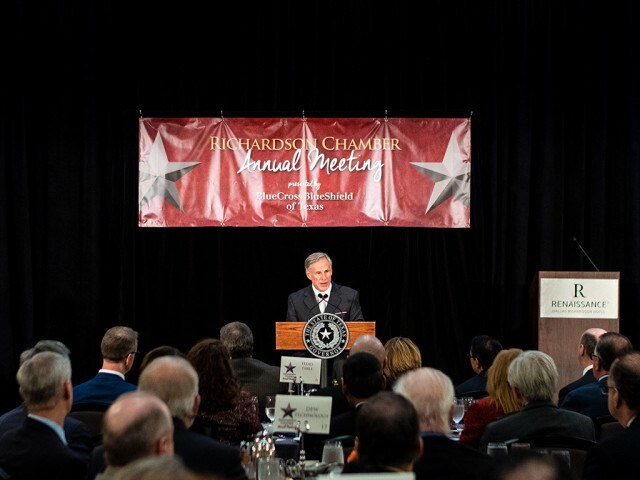 Governor Greg Abbott today kicked off his State of the State tour across Texas by speaking at the Richardson Chamber Of Commerce Annual Luncheon. The Governor discussed his priorities and emergency items for the legislative session including reining in property taxes, reforming school finance, keeping our schools and communities safe, increasing mental health resources, and providing relief for Texans impacted by Hurricane Harvey. "We have accomplished so much, but you know as well as I do that more must be done to fulfill the promise of Texas - including right here in Richardson," said Governor Abbott. "No doubt, what I have outlined is a transformative agenda. But I believe that working together with leaders in the legislature, as well as with your partnership here in Richardson, we can seize this opportunity and build an even brighter future for Texas." For over 70 years, the Richardson Chamber of Commerce (RCC) has served as the voice of the local Richardson business community. RCC is accredited as a 5-star chamber by the U.S. Chamber of Commerce and currently serves over 700 active members.